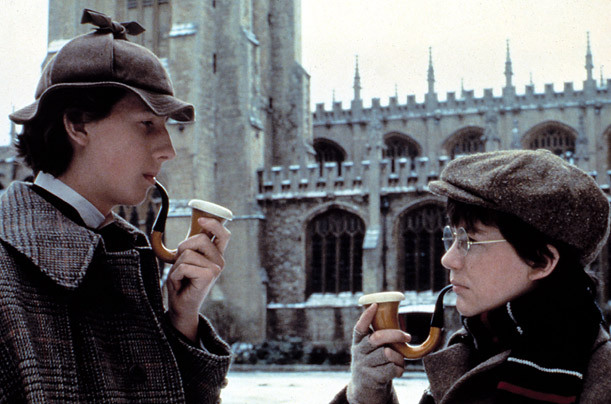 In the 1985 film Young Sherlock Holmes, Holmes tells Watson the following riddle: “You’re sitting in a room with an all-southern view. Suddenly, a bear walks by the window. What colour is the bear?” (He says “colour” not “color” because he’s from the UK.) As I recall it takes Watson most of the movie to give the obvious answer—white—because the bear must be a polar bear. All southern view…North Pole…polar bear…you get the idea. Over the years I’ve hear other versions of this riddle. The most common seems to go something like this: “A hunter travels a mile south, a mile east, shoots a bear, then travels a mile north to her starting point. What color was the bear?” People assume that this riddle is isomorphic to the previous one, because (supposedly) there is only one place on Earth you can travel the same distance south, then east, then north, and return to the beginning. But this is wrong. There are an infinite number of places on Earth you can travel in a loop that is 1 mile south, then 1 mile east, then 1 mile north. C = 2πr = 2π [1/(2π)] = 1 mile. 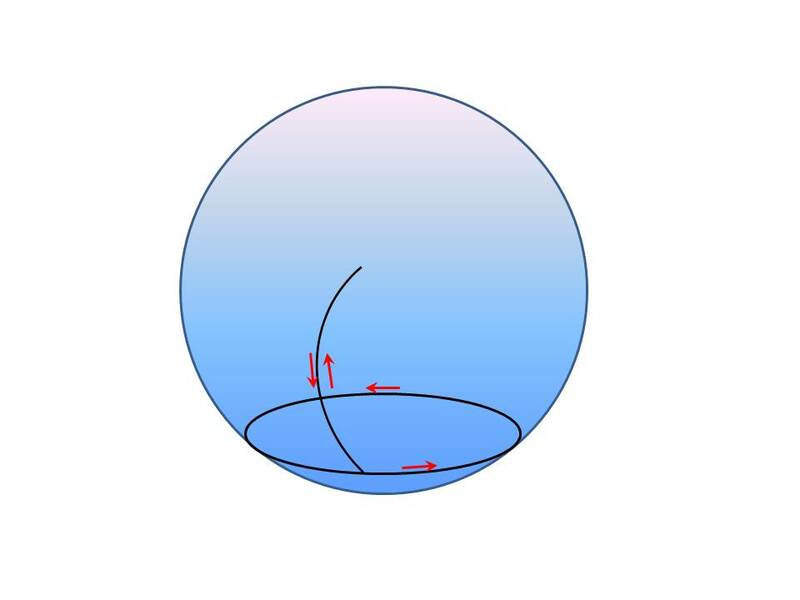 (I said roughly because we’re on the surface of a sphere, so the circumference of a parallel is not exactly 2πr—because r is an arc length, not a straight line—but 1 mile is so much smaller than the radius of the Earth that we can assume a locally flat geometry.) If a hunter started his journey 1 mile north of this latitude, then of course he could go 1 mile south, then 1 mile east (circumnavigating the South Pole!) and then 1 mile north, and return to his starting point; I presume there would be no bears. miles from the South Pole (again, this is a flat approximation to a spherical problem). So the most general South Pole solution is that the hunter should begin 1 + 1/(2πn) miles north of the South Pole. For example, take n = 5. If a hunter starts 1.0318 miles from the South Pole, she can go south 1 mile, east 1 mile (circumnavigating the South Pole exactly 5 times) then north 1 mile, and relax in her hot tub. No bears will be harmed, unless some evil genius has released them in Antarctica. The original version of the riddle, as given by the young Sherlock Holmes, is superior, since it has only one solution. We can conclude that Sherlock Holmes was good at math. Well, I think that the two versions of the puzzle are indeed equivalent. I fact, if I say that “a hunter travels a mile south, a mile east, *shoots* a bear, then travels a mile north to her starting point” I am claiming that the hunter had actually shot a bear, that is, bears exists at that latitude. This obviously rules out the possibility that the starting point is in the Antarctica. More precisely, one can say that: if a bear is actually shot a mile south and a mile east from the starting point, the starting point cannot be in the Antarctica. Well, that type of logic could be applied to the first riddle as well, a caged grizzly bear was released in the north pole, thus their is no way of knowing what color the bear was that walked past the window of the cabin with an all southern view. So much talk but allways the same answer. THE BEAR IS WHITE. So the problem is correct because there is only one solution. The problem dont say there is only one way for the hunter. …And a window “all-southed” must be in North Pole?? Nah….. Thats not the Sherlock I know…. You must not have read the part of the post where I say “I’ve hear other versions of this riddle”. It is one of those versions I go on to discuss, obviously. “You’re sitting in a room with an all-southern view” There is no such olny southern view. Even in North Pole you can see the Pole star. Which is obviously a Northern view. ?? Suppose it’s cloudy at the North Pole. Every window faces south, whether you can see the sky or not. I could be sitted in a room where the only view is trough a telescope poiting the South Celestial Pole. Infinite solutions. Whatever. Clearly you miss the point of the post.